1. MARCH Strip Twist Ready for sandwiching. Update 1/30/2011: Got this one pin basted today. Progress! Update 2/5/2011. I know I should be working on number 10, but I couldn’t resist getting this one quilted today. However, I broke 4 needles and many thread breaks so it was very frustrating. But it’s quilted and I like it much better. Update 3/27/2011: This quilt is finished. Put the last stitch in the binding this afternoon. Won in the raffle by Sue Fisher’s mother-in-law. I have a pic somewhere. 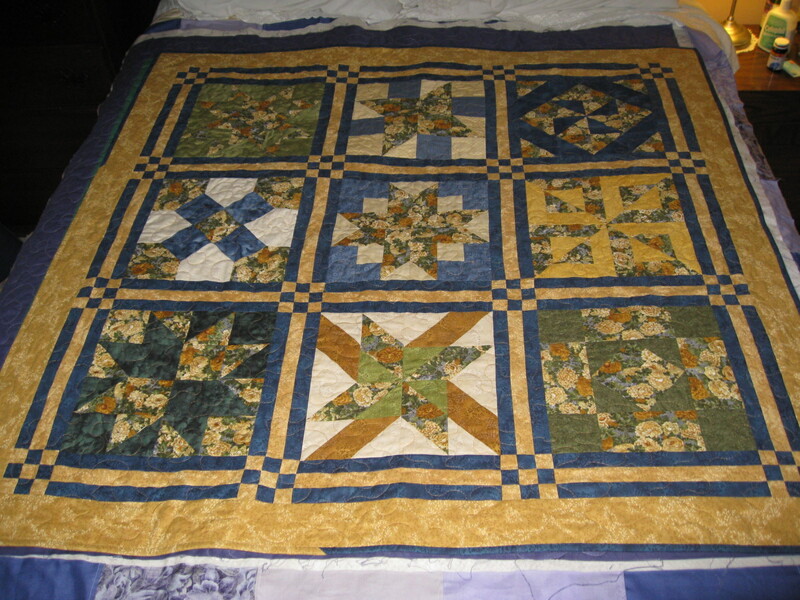 7/9/2011 – Pieced the backing. 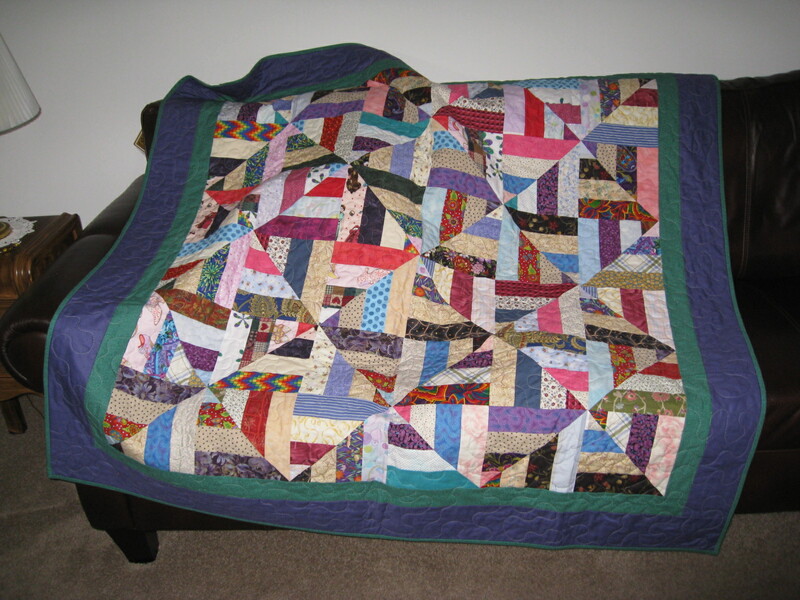 7/22/2012 – Mostly quilted, binding attached and hand sewn down. 3. Darby’s Twister Quilt Blocks cut, needs piecing. 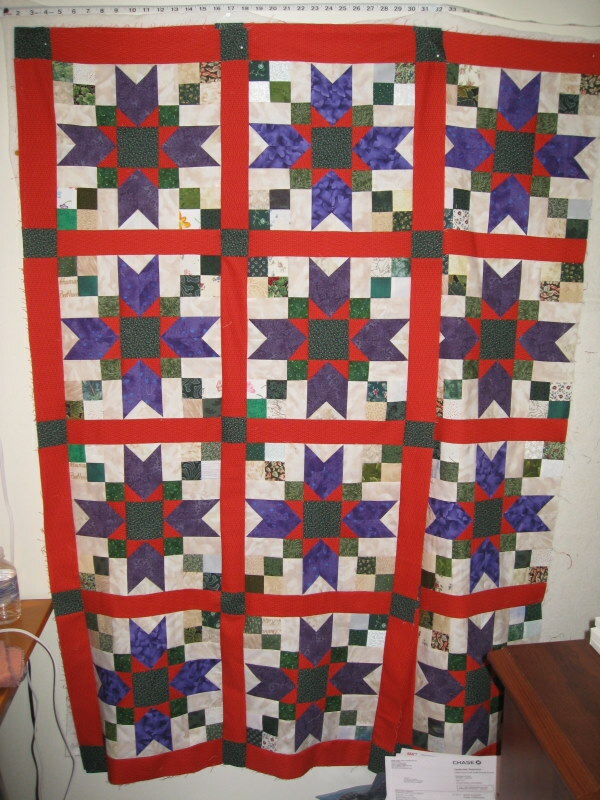 June 23, 2011: Started piecing the rows. Update 4/01/2011: In the interest of actually finishing this quilt, I will keep the borders simple. I’ve got the brown and blue used in the top set aside so I’ll see if it’s enough to finish this one off. Update 4/10/2011: Got the borders attached. Now I have to choose a backing from my stash. That will hold me up. I really don’t like piecing backings. 🙂 Backing is pieced. Need a large enough surface to sandwich for quilting. Need to put the back together, sandwich and quilt. Update 2/1/2011: I only managed to get the pieced border blocks done this month. Not much sewing happened in January this year. Update April 2011: Got all the borders finished and attached. Though I got too anxious and forgot the third border before the pieced border. So this version will have five borders instead of seven. Update 6/12/2011: Put together the backing. Update 6/19/2011: Got this one sandwiched and ready for quilting. But I need to order more of the green to do the binding. As luck would have it, it’s on sale right now at Connecting Threads. $2.96/yard. Hopefully it will get here to I can finish this one in June. Update 6/25/2011: I’m quilting away on this one. Doing an all over meander. The binding fabric arrived today so I just might finish this one in June. Finished this one, but can’t remember the date. Definitely in 2011 but not sure which month. 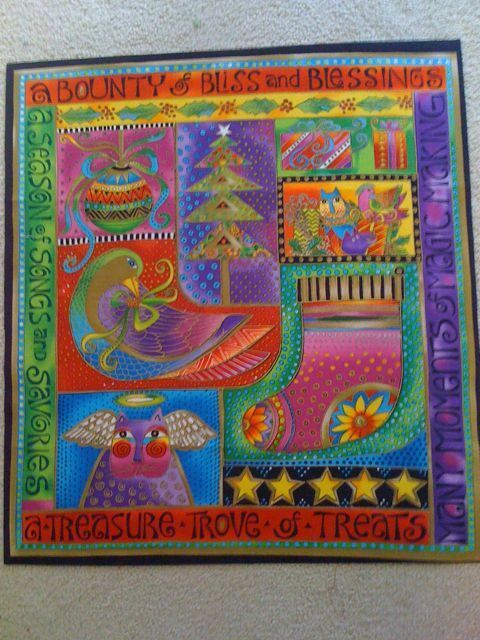 Donated to the Phoenix Project for the Colorado Wildfire victims June 2012. 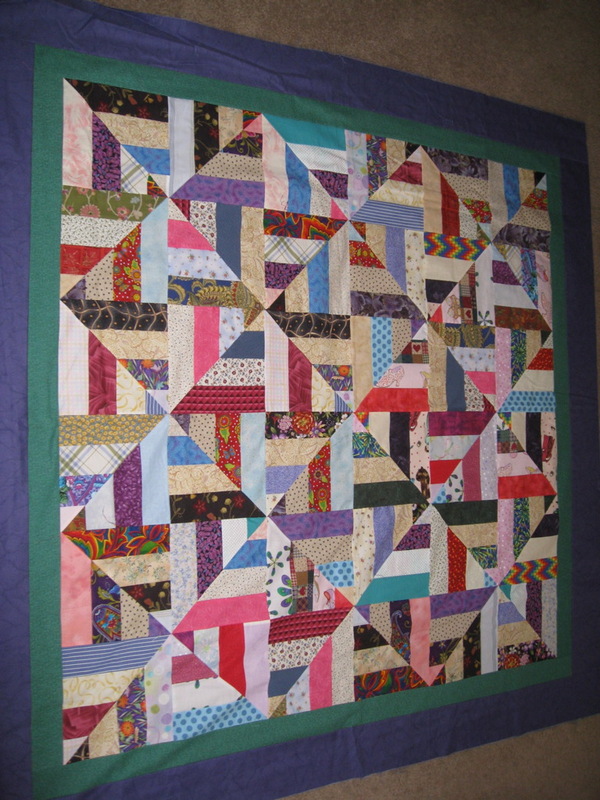 6/24/2011 – Added the 2″ inner cream border. 6/12/2011 – Quilted an all over medium meander with cream thread in the center and gray thread on top for the borders and setting triangles. This one is ready to bind.6/27/2011 – Started sewing down the binding. 6/30/2011 – FINISHED Just in time. May seems to have just passed me by. Nothing happened on this quilt this month. I’ll have to catch up later. 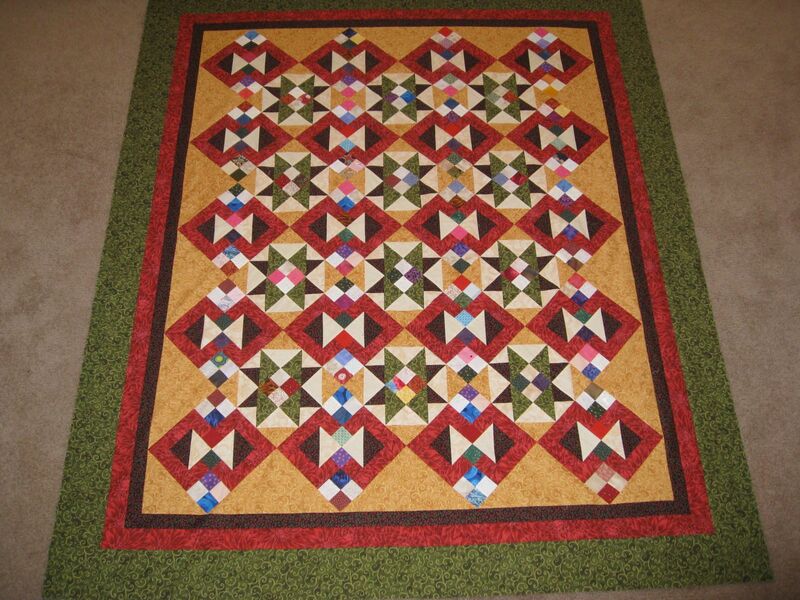 October 2012: Finished quilting top. November 2012: Binding made and sewed on top. I have block sets from the past four years. 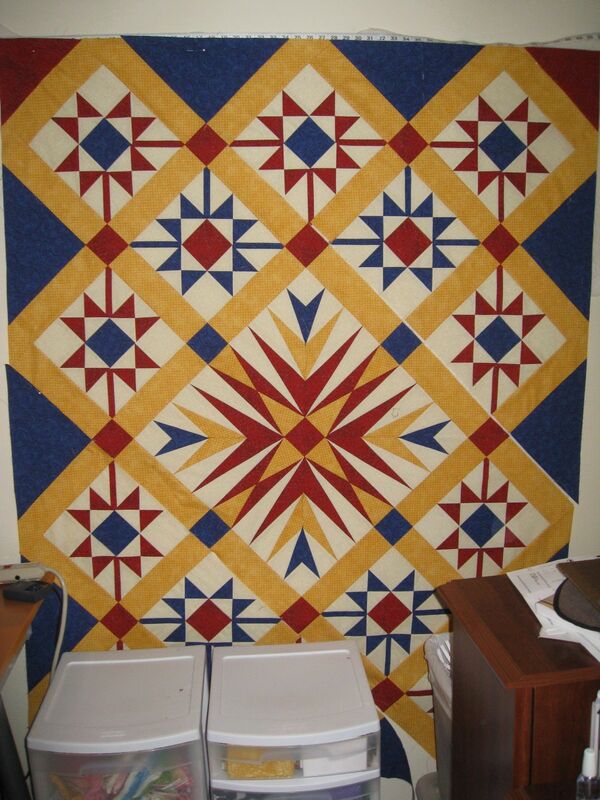 I just want to get one of the sets made into a finished quilt in 2011. UPDATE 2/1/2011: Realistically, I’ll consider it a completion if I get one set designed into a top and the top completed. That will be a major accomplishment for me. UPDATE: 2/12/2011: I decided on the 2010 Squishie blocks. I pieced sashing today and got the center top finished. Just have to decide on a border. UPDATE: 2/28/2011: This quilt is finished. I put the last stitch in the binding at 10:10 pm. 54″ x 54″ square. 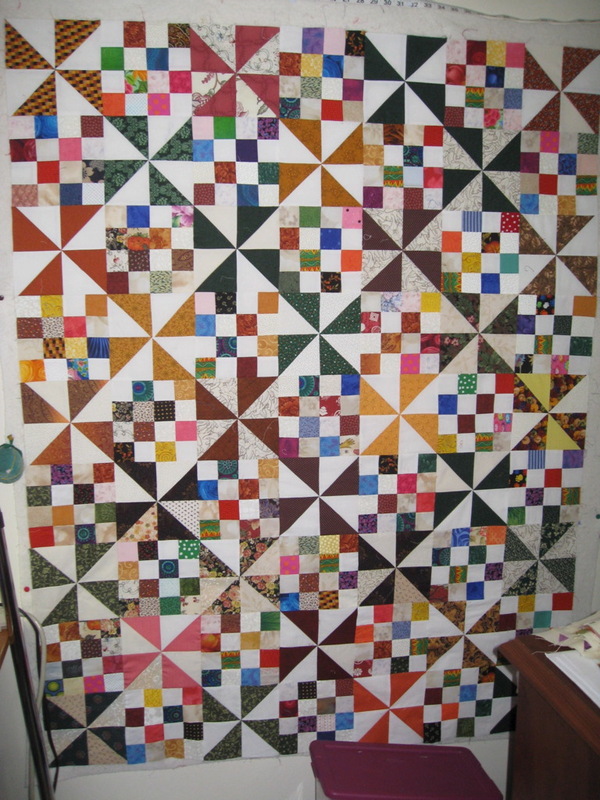 7/4/2011 – Finished the piecing the blocks together. 7/9/2011 – Finished the top at 40 x 44. 8/2011 – Finished the binding on our way up to Humboldt County. Gifted to Quinlan Rose Bridgman August 2011. July 14, 2012: Added borders. Ready to be sandwiched together. November 21, 2012: Sandwiched with muslin backing ready for quilting.